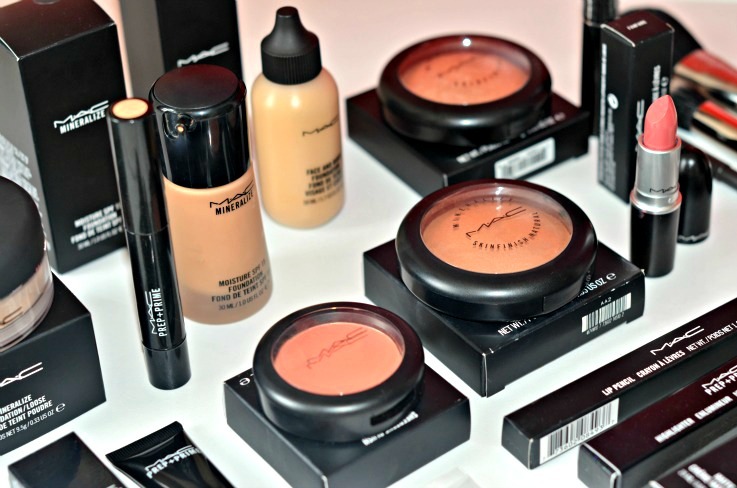 Nearly nothing beats going to a M.A.C counter and knowing you are gonna go crazy and buy a whooooooole lot of stuff! I don’t believe in shrinks when it comes to having a bad day. Shopping therapy at the M.A.C store is my remedy. I have used M.A.C. before, just a lip pencil or their famous lip glass here and there, but nothing too much. Last Wednesday we went to the nearby fun town of Utrecht for some shopping and great foods. I have totally been skimping on a good foundation and skincare for months now. This bad behavior was leaving my skin dry and in bad shape. I thought it would be a great idea to buy two different foundations! Why not splurge a little huh? I told the lady at the counter I was looking for a dewy, medium coverage foundation and she immediately came out with one of MAC’s new bestsellers: The MAC Mineralize Moisture Foundation in the color NC 37. It is filled with vitamin E and moisturizers, a 77 mineral complex, and sheabutter. When she applied it on my skin, I felt like a new person. The color was absolutely perfect and it gave my skin a gorgeous sheen and glow like I had been in the sun all day because of the light reflecting properties. This foundation is best suited for dry, normal and combination skin. My skin is normal to combination but very dehydrated, so I thought this would be a great choice. I have been told this foundation is not very suitable for oily skin types, because the texture is fairly runny when you apply it to your hand. The shine and glow can make your skin appear even more oily. It would be possible to wear this on oily skin but you have to make sure to prep your skin with a primer. This foundation has a pretty good medium coverage and evens out your skin tone beautifully. but believe me the reviews have been really good and they are accurate! It’s also nice that this foundation has an SPF 15, making it a great daytime foundation as it will protect your skin from the sun. When it is extremely warm and humid, this foundation does tend to “melt” slightly; so I think this would be a perfect fall and winter foundation when the air is really dry. Make up artists love to use this foundation for photo shoots. I thought it would be great to use this product for my outfit posts. This foundation is water based and has a lighter coverage then the Mineralize Moisture Foundation, but it evens out skin tone beautifully. Once it has set after applying, this foundation will stay put on your face all day and it won’t require any touch ups. It really melds into your skin. The texture is also thin but creamy when applied to your hand and it gives a beautiful satin finish on the skin, which I am absolutely in love with. 4: Highligher for highlighting cheekbones called Mineralize Skinfinish in the color: “soft and gentle”. A prep you apply after you’ve applied foundation and before your powder for an ultra smooth finish! I picked it up for hot and sunny days when the face tends to get sweaty. How beautiful are the colors of this lipstick and lip pencil? I am absolutely obsessed with this pair! The lipstick is my new favorite and it tastes like sweet cinnamon, yummmmy! I usually don’t buy so many products at once, especially not make up, but after using it for two days I realise it was so worth it! amazing quality which will go a long way! I have always been a Dior and Bobbi brown kind of girl and lately I was just using L´oréal and Maybeline products which are actually decent as well, but change is good! I have had a beauty change of heart and I will admit that I am slowly developing a new found obsession for MAC. Can a girl feel more brand new? What is your favorite make up brand at this moment? I wish you all a fabulous day and new outfit posts are coming up soon!